Sunday. A day set aside for worship. A day of peace. A day of rest. A day for right-wing evangelicals to support the devil's spawn...Donald Trump. Paul McGuire, evangelical author and radio show host, is leading the latest attacks against anyone who dares stand up to Trump. The extent of the extremism we're seeing on the Christian Right is appalling. Their hateful attacks against anyone who is opposed to Trump and his corrupt regime, is hypocrisy times ten. McGuire has accused anyone opposing Trump of literally being demonic! Really. I know it's hard to believe in this day and age of enlightenment, but there are people who believe crackpot theories like a globalist Luciferian rulership system out to get Donny. 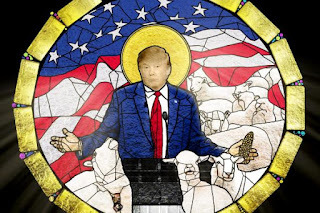 This religious cult should be called Trumpism instead of evangelism. They claim we're experiencing one of the world's greatest spiritual battles when people resist Trump. They're partly right about that. It's God versus Trump and his slavish minions. These right-wingers sing Trump's praise while he systematically dismantles our democracy. All in the name of a God that doesn't fit in with the pantheon of great religions.